Looking to bring some fun and excitement to the annual Easter party? Our Mascot Easter Bunny Costume will do just the trick. You'll be ready to hide oodles of Easter eggs when you wear this adorable costume. Just be sure to not pick too good of hiding places, Easter eggs found around Halloween aren't the freshest, we know from experience! Whether you chose to wear this costume to entertain your children, kill it at a costume party or maybe you’re in need of a few extra bucks and decided to pick up a side job at the mall, the Mascot Easter Bunny Costume is perfect! 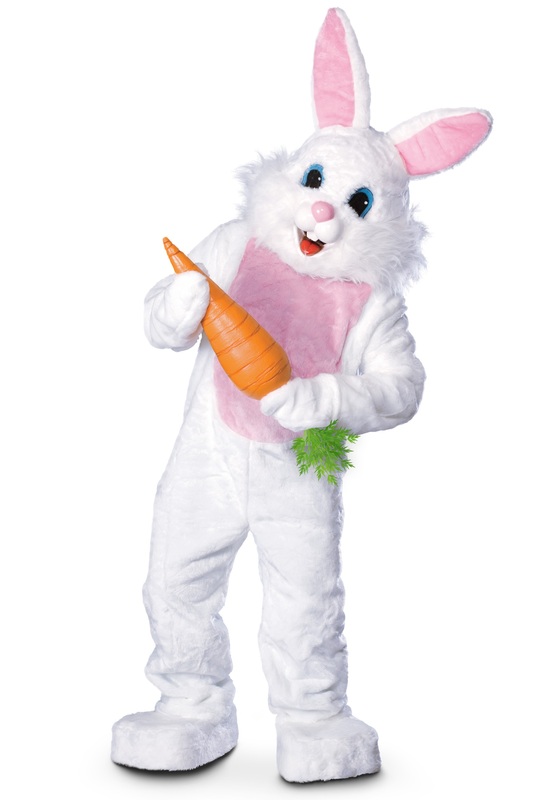 Our costume will you the ability to bring the mysterious Easter Bunny to life, looking as realistic as possible for a make believe bunny. You will be unrecognizable when you jump into the plush white jumpsuit, put on your pair of white mitts, oversized bunny feet and of course the large and in charge bunny headpiece. If you are going to use this Easter Bunny costume for the gig at the mall, spending your days having your picture taken with children on your lap (sounds a little creepy when you put it that way) then you may want to get in the spirit and pick up one of our bunny carrot accessories. Hanging out with kids all day can be exhausting and you’ll need a little pick me up! Hippity hoppity the Easter Bunny is on his way!